Owensboro band Far From Fallen had already written and recorded their new album, “Arise From The Ashes,” when the decision was made to hire second guitarist Greg Cecil. With a another guitar in the mix, the band went back and rewrote the new songs on “Arise” to incorporate a second guitar line. The additional guitar added new dimensions to the metal band’s already complex sound, bassist Blake Littleton said. The band — Littleton, Cecil, drummer Matt Simmons and founding members vocalist Kevin Rhodes and guitarist Brian Fulkerson — is already writing songs for a new album, while working to market “Arise From The Ashes” to record labels and promoters. The band is playing at 9 p.m. Sunday at Lanhuck’s Tavern, 321 East Columbia Street, with Anthem for a Massacre and Sol. Admission is free. Fulkerson said the idea of adding Cecil to the band had been brewing for some time. The lineup of Rhodes, Fulkerson, Simmons and Littleton has been consistent for several years. While adding a new guitar player to the lineup could have been awkward, Simmons said Cecil fit in immediately. “It can take so long to get someone to learn (the songs), but he had everything down in a week,” Simmons said. With the new album, “we really feel like the album sounds like an album, not a collection of songs,” Fulkerson said. The band has had its recent hassles. Getting “Arise From the Ashes” pressed has been a problem, so the release of the physical disc has been delayed. Several new songs are streaming on the band’s MySpace page. Also, an east coast tour fell through, because of problems with the agent coordinating the tour. “We’ve never had trouble with agents — we’ve had trouble with people who say they are agents,” Littleton said. Plans for the east coast tour had been in the works since October, Rhodes said. But after multiple incidents of erratic behavior, the promoter canceled the tour at the last moment — without bothering to personally notify the band. “It basically ended up with the guy (posting) a bulletin on my MySpace page, saying he was done,” Rhodes said. When sending out promo material, “we’re looking for people who have well-known clients,” Fulkerson said. Simmons said the band will keep promoting the new album and will be booking additional concerts. Blabbermouth.net reported earlier this week that black metal boogeyman Varg Vikernes, aka Count Grishnackh, is about to be released after 16 years in a Norwegian prison. If you’re reading this, you probably already know Vikernes’ violent, meaningless story. In August, 1993, Vikernes – who was then bassist for the Norwegian black metal band Mayhem – stabbed to death fellow band member Euronymous (real name Oystein Aarseth). Euronymous was a godfather of the black metal scene: When not playing in Mayhem, Euronymous ran a black metal record store and his own record label, Deathlike Silence. Vikernes’ first Burzum album “Aske,” was released by Deathlike Silence. Vikernes was also convicted in participating in three of the church arsons perpetrated by some of the black metalists that destroyed 24 historic churches across Norway beginning in 1992. Behind bars, Vikernes wasn’t exactly a model prisoner – he attempted to escape in 2003 – and was denied parole four times. In prison, Vikernes became something of a Nazi martyr – but has been quoted in interviews saying he has not been in contact with Nazi groups for some time. What do we do now that Vikernes, this ghost of black metal’s past, is once again back to haunt us? After reading the latest press accounts on Blabbermouth, my initial impression is that Vikernes is not terribly smart. I know that’s a caustic statement, but don’t get mad yet, hear me out. The murder of Euronymous still stirs up emotions and – if reading Blabbermouth is any gauge – there are a lot of people out there who are not happy to see Vikernes released. However, the Burzum Web site has been quick to publish details about Vikernes’ family (he has a wife and young children: Apparently, murderers get conjugal visits in Norwegian prison), and owns a farm in the Norwegian town of Bø, where he and his family will be living after his release. I ask you: If you were a perpetrator of a crime that still inspires violent emotions in people 16 years after the fact, would you release information about your family and voluntarily all but allow your home address to be posted on the Internet? By doing so, isn’t Vikernes all but asking for trouble for himself and – even worse – for his children? If someone can explain how Vikernes’ decision to allow the release of such details on his own Web site was intelligent, please do so. From where I sit at the moment, those actions look plain dumb, if not actively hazardous to his health. I’ve heard some of Vikernes’ work as Burzum. “Aske” was underwhelming, but “Filosofem” had some very impressive ambient black metal moments – particularly “Jesus død” and “Beholding the Daughters of the Firmament.” It’s easy to listen to “Filosofem” and hear how the album influenced some of the black metal bands that followed. I’ve heard bits and pieces of other Burzum albums (some that were recorded after Vikernes entered prison), but none of it measured up to the best moments of “Filosofem” … which is my way of suggesting that Vikernes ceased to be musically relevant 16 years ago. The best thing that could happen would be for Vikernes to disappear quietly from view by retiring to his farm and staying there – not appearing in the media and not making music. I’m not discounting the belief that the early Norwegian black metal bands actively felt repressed by modern society. I also understand they had strong objections to the way the Viking culture of Norway had been brutally destroyed by Christianity between 995 and 1015 A.D. (again, I’m citing Ian Christe’s Sound of the Beast for those dates). The early black metal bands of Norway felt that injustice acutely – perhaps in the way only teenagers, who are often passionate beyond reason – could feel it. But Vikernes wasn’t a revolutionary: He was a highly disturbed teen, who committed vapid, pointless acts without reason or justification. He doesn’t deserve to be remembered, and surely shouldn’t be idolized. Maybe being released from prison will have the effect of defanging Vikernes’ power as black metal’s “symbol” or icon. The smartest thing people who listen to black metal can do is pretend Vikernes is invisible. His detractors should do the same – the world doesn’t need Vikernes as a martyr for National Socialism. The best way to take away Vikernes’ power is to ignore him. 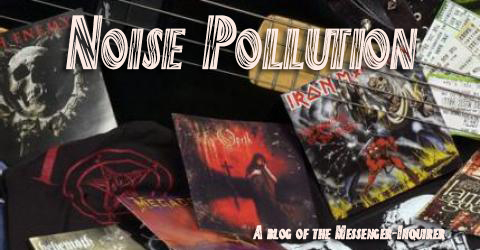 Noise Pollution gets a shout out from Queensryche. Logically, I’m sure Queensrÿche vocalist Geoff Tate did similar video IDs for every metal Web site in the world … but so what? We’re official now! Whoo hoo! Chris Cornell, what the #%&#! happened to you??? If you like painful musical experiences, the new Chris Cornell solo album, “Scream” is streaming in its entirety on his MySpace page. As you surely know, Chris got his pop music freak on with “Scream,” even partnering with producer Timbaland on the project. I’ve heard seven tracks so far – and I’m already seriously considering taking an ice pick and a Molotov Cocktail to my ear drums. Chris Cornell, right, with producer Timbaland. Is this really the same guy who fronted Soundgarden on “Louder Than Love” in the late 1980s? I remember when I first picked up a copy of “Louder Than Love”: That album was my first experience with “grunge” metal, and I was struck by how raw and angry it was. I loved that album. Although Soundgarden became a bit more refined on following albums, they never lost that harsh, bitter edge. After Soungarden disbanded, I stayed in the Cornell camp for as long as I could. I didn’t think Cornell’s first solo work, “Euphoria Morning,” was terrible – it was more alternablues than rock, but it had its moments. But his work with Audioslave was either “meh,” “blah” or “ugh” from the start. I’m mean, seriously, Chris – what were you thinking? Were you so tired of the rock thing that you decided to remake yourself as a teenage pop diva? Were you really that envious of Britney Spears? Sad. Sad, sad, sad. I’m gonna go home now and tear my “Louder Than Love” poster off the wall. P.S. : Chris? Somewhere, Kim Thayil is listening to your craptastically terrible album and laughing himself sick. The Brothers brings metal to Owensboro! Whoa! I had no freakin’ idea. Here I’ve been, sitting in Owensboro, doing this metal blog for months … and I was completely oblivious to the fact that The Brothers venue at 624 Emory Drive is bringing national metal acts practically to my front door. Check out the list of concerts below. In the next two months, The Brothers is bringing Obscura, Shai Hulud, Psyopus and Abigail Williams to the city. And tixs are cheap, too. Awesome. I don’t know the guys that run The Brothers, but I like ’em already. I hope they can keep the shows coming. Wolves in the Throne Room drummer Aaron Weaver is passionate about the transcendent power of black metal. But grasping the Washington State band’s artistic vision requires an understanding of both how and why black metal came to exist. In the beginning, the young Norwegian bands who created what came to be called “black metal” were not entertainers but revolutionaries. Angered by what they saw as the subjugation of Norway’s pagan and Viking heritage by Christianity, bands such as Emperor, Mayhem and Burzum created vicious, agonized music that both reveled in the forests and mountains of the natural world while serving as a rebellion against modern Norwegian life. The rebellion spun out of control, of course – changing from artistic to literal violence. There’s no need to recount that sordid tale here, other than to say by the time the movement came crashing down, the term “black metal” had become synonymous with teenage anarchy. Considering its ignominious end, it’s tempting to dismiss the entire Norwegian black metal movement as youthful stupidity – but to do so is to ignore the revolutionary power of the music. The sound created by those bands was more than just music: It was a scrabbling, desperate attempt to escape from the strangling confines of daily life and connect to an older, more primal spirit. When prophets went into the wilderness to starve and scourge themselves in the hopes of seeing a vision, weren’t they looking for just the same type of transformation? Weaver – during a recent, rare interview to discuss Wolves in the Throne Room’s breathtaking new album “Black Cascade” – said he embraces the ‘black metal’ label and ethos, and said the band has a goal similar to that of the Norwegian bands in the 1990s. While black metal is not hippie music, there is a connection between the hippie back-to-the-earth ethic and black metal’s scream against modernity. Wolves in the Throne Room was formed by brothers Nathan and Aaron Weaver in 2003. From a farm house outside Olympia, Washington, the band created a sound that blends the blazing raw anger and bleakness of black metal with segments of beauty and melancholy. The hope, Weaver said, is that the listener will use the music to leave the everyday behind. “The goal is to express the emotions you feel, the intense energies you feel when you enter a mythic space,” Weaver said. “I think all forms of music, but especially black metal, are akin to shamanism – using dance and movement to leave the physical plane and journey to a different space. “Through our music, we’re attempting to do the same thing – to access a different world and bring something back … to gain some sort of power or knowledge and bring it back to the community,” Weaver said. The band has plans to tour extensively following the release of “Black Cascade.” Weaver said performing the songs live, or rather, attempting to play the songs while dealing with the pains and annoyances of the road, is trying. The band is influenced heavily by their natural surroundings on the farm. Environmentalism, or at least a deep appreciation of nature, is a large part of the band’s ethos. When asked if he believes it is possible to change the way people think about nature through music, Weaver said the band that band doesn’t try to force feed a philosophy to its audience. The music feels very personal in nature – as if it were meant to be heard alone, through headphones. But the band has said previously Wolves is a live band, and the songs were written with the intent of being played for an audience. Even so, the crowds at Wolves shows are somewhat different than those at concerts by other metal bands, Weaver said. “I think listening to a record is a very personal thing … That has to be a personal act and it facilitates a personal journey of sorts. You’re swept away by the music,” Weaver said. At a live concert, “you’re feeling yourself part of a communal event: You’re being touched by the energy of the performers and the people around you. You can find a review of “Black Cascade” here. Dutch band Hail of Bullets was formed in late 2006, after a drinking session among Gorefest drummer Ed Warby, Thanatos guitarists Stephan Gebédi and Paul Baayens, former Houwitser bassist Theo Van Eekelen and ex Pestilence/Asphyx/Bolt Thrower vocalist Martin Van Drunen. From the outset, the goal of Hail of Bullets was to create guttural, gut-punching old-school death metal. The super group succeeded last year, when Metal Blade Records released “… Of Frost And War,” a monster concept album documenting the merciless Nazi/Soviet war of annihilation that began with the German invasion of the Soviet Union June 1941 and ended with the Red Army conquest of Berlin in 1945. Since its release, “… Of Frost And War” has received nothing but praise from the metal press – and was named one of the top metal albums of 2008 by prestigious metal magazines and Web sites such as Decibel and Metal Storm. In May, the band will play its only U.S. concert so far, when they appear at the Maryland Deathfest. Earlier this week, HoB guitarist Stephan Gebédi graciously agreed to answer a few questions about how the concept for “… Of Frost And War” was created, the writing process, the challenges and joys of multiple band responsibilities and plans for the next Hail of Bullets album. 1. First, “… Of Frost And War” is a fantastic album. I was struck by how much the album sounds like war. I liked how the tempo of the songs reflected the lyrics: “Ordered Eastward” “The Crucial Offensive” and “Advancing Once More” are very driving and indicative of the offensive, while, with the slower opening pace of “General Winter,” I could imagine the German tanks and trucks bogging down in the mud … before the tempo takes off, reflecting the Soviet counter-offensive. What came first, the music or the concept for the songs? In other words, did you write the music to reflect the story in the lyrics, or was the music written first and the lyrics second? Stephan Gebédi: Well a bit of both actually; we started with the music for 2-3 songs and when Martin heard those he said he had been thinking about a concept album on the battles at the Eastern Front during WWII for a long time, and these songs were the perfect soundtrack for his visions. So from that point we kept the lyrical concept and the chronological order in mind a bit, although we also felt that the songs should stand on their own as little death metal opuses. The concept should be a bonus for those who want a little bit more out of an album, but the individual songs should also be good enough for the average death metal fan that just wants to hear a great song. 2. How did the concept “… Of Frost And War” originate? When the demo was recorded, were you already planning to record a full scale concept album about the Eastern Front? For that matter, was the band created with the intent of focusing on war-related themes? SB: This was already more or less explained in the previous answer I guess. When we adopted the name Hail of Bullets, some of the songs were already written and we already had this concept in mind. So we needed a name that would fit the concept. It was simply like all pieces of a puzzle coming together. 3. Lyrically, the level of historical detail on the album is extremely impressive. For example, I thought I had read quite a bit about World War II in the Soviet Union, but I was unaware of a Soviet air squadron made up entirely of women. How were the lyrics researched? SB: Thank you. Martin had already read quite a lot of books about WWII and this particular part of the war had always fascinated him. So the basic knowledge was already there. He went through some more books and documentaries whilst writing the lyrics because he wanted them to be historically accurate. Especially in Europe, WWII is still a very touchy subject so it was very important for us to base all lyrics on historical facts, to avoid any unnecessary controversy. Thanatos? Are there things you can do musically with HoB that would not work with Thanatos ? 5. What is your favorite HoB song to play live? On the other hand, is there also a song that is particularly challenging to play? SB: I like playing most of them… some of my favorites are ‘Ordered Eastward’, ‘Berlin’, ‘The Crucial Offensive’ and ‘General Winter’. It’s always challenging to play the guitar harmony in ‘Inferno at the Carpathian Mountains’ and for Paul it’s definitely a challenge to play the lead guitar in ‘Berlin’ with the right amount of feeling. 6. Death metal has changed greatly over the years. Today, bands as diverse as Meshuggah, Obscura, Soilwork and Opeth all incorporate some elements of death metal into their songs, or play a death metal variation. I’m not asking you to comment about any of those bands, but since HoB is a return to the traditional sound of death metal, do you think the genre has a whole as drifted away from its root sound? SB: Maybe, although I don’t think it has drifted away from its root sound as a whole, but at a moment there were definitely too many bands that started playing this kind of hyperspeed U.S. death metal stuff, which focussed too much on speed and beats per minute instead of writing actual good songs. I’m not saying that none of these bands could write good songs, but too many bands jumped on the bandwagon and added speed for speed’s sake. That’s why it was important that bands like Bolt Thrower and Obituary stayed true to the original death metal sound. I love bands like Vital Remains or Misery Index that do use a lot of blast beats just as much though, so I think there’s room for various types of death metal. 7. I read an interview in Vampire magazine that said you have the option of making up to three HoB albums with Metal Blade. Is there any new material in the works? If so, do you envision another album with a war theme? Would you do another concept album? 6. Do record label differences make it hard for the band to tour? 8. You’ll be playing the Maryland Deathfest later this spring, but that’s the only U.S. date scheduled so far. Thanatos is about to release a new album, but are there plans to do a larger HoB tour later? SB: Thanatos won’t be playing that many shows this year so that’s not the problem. Maryland Deathfest more or less ‘demands’ exclusivity so if we’re going to do more US shows they definitely have to be planned later this year or sometime next year. But if the MDF will be a success for us we’ll definitely try to come back for more shows later. 9. “… Of Frost And War” has been very well received, at least by the reviews I’ve seen. How have audiences been reacting to the songs? The music is very violent, but in a really cathartic way. I imagine audiences have been moshing like mad at the shows. SB: Yes, the reviews have been great everywhere and as far as we know the album sold pretty well. The crowd reactions have been very enthusiastic in most places. We had some pretty wild crowd reactions all over Europe, with people headbanging, moshing and old fashioned stage diving. Martin definitely knows how to get a crowd going! 10. Considering your obligations with Thanatos, when do think a new HoB album will see the light of day? SB: Now the Thanatos album will finally be released within 1 or 2 weeks from now and the new Asphyx is also more or less finished, we can concentrate on HoB again. The actual plan is to start recording again at the end of 2009 and release the album around March/April 2010. You can check out Hail of Bullets by visting their YouTube page, and by hearing full tracks on their MySpace page.